In the early 1980’s a young Packaging Engineer, Bob Moran, returning home from visiting packaging exhibitions in Chicago and Paris chanced to visit the Science Museum in London. Thinking he knew a good deal about machine design and construction, he was totally deflated by the incredible works of Charles Babbage and his engineer Joseph Clement in their efforts to mechanise computing for the first time in the 1820 - 1830’s. Little did he know that years later he would unexpectedly be invited to quote on replicating that iconic surviving small portion of Babbage’s Difference Engine No.1, he marveled at that day. This venture did not materialize but Bob was so challenged and captivated that he decided to proceed alone with the guidance of the late Professor Allan G. Bromley the world renowned expert on the works of Charles Babbage. Many years have lapsed and we now find Bob teamed up with another computer pioneer, Max Burnet (BACK MUSEUM) in setting up a Discovery Shed in Mona Vale which is a haven for thinkers and tinkerers and now houses a remarkable collection of iconic machinery. It is the bicentennial year of when Charles Babbage first thought to mechanise computing (1812 or 1813). So what do we have to show for this huge lot of research and tinkering to celebrate the bicentenary ? The bronze and iron small portion of Difference Engine No.1 (1833) is nearing completion it is built as close to the original as possible and will be a working model. The mockup of the full size machine has commenced using light weight materials, simulating bronze and iron, which would be too costly and time consuming to use. To see this model is quite astounding, as it stands 9’ high 11’ long and 5’ wide, it was intended to be driven by steam with a complexity of mechanism that is hard to believe for the 1830’s. Now for the twist, it happened to be the 26th December 2012 Boxing day, which is Charles Babbage’s birthday it is also Max Burnet’s birthday and there are 150 years between them, not only that but John Deane from the Australian Computer Museum Society another computer pioneer and a distant relative of Charles Babbage was at the Shed to celebrate this event. Then Pamela Garnsey arrived announcing that “she was distantly related to Charles Jearrard, Charles Babbage’s builder” !! With many iconic machines in the Shed, Babbage’s Difference Engine No.1, Max’s rare DEC PDP-7 mainframe, his PDP-8 (the first desk top computer 200lb) and Allan Bromley’s section of the Broadmeadow Totalisator, ensures that EXCITING THINGS ARE YET TO COME, stay tuned! Copyright Bob Moran, 2013. All Rights Reserved. 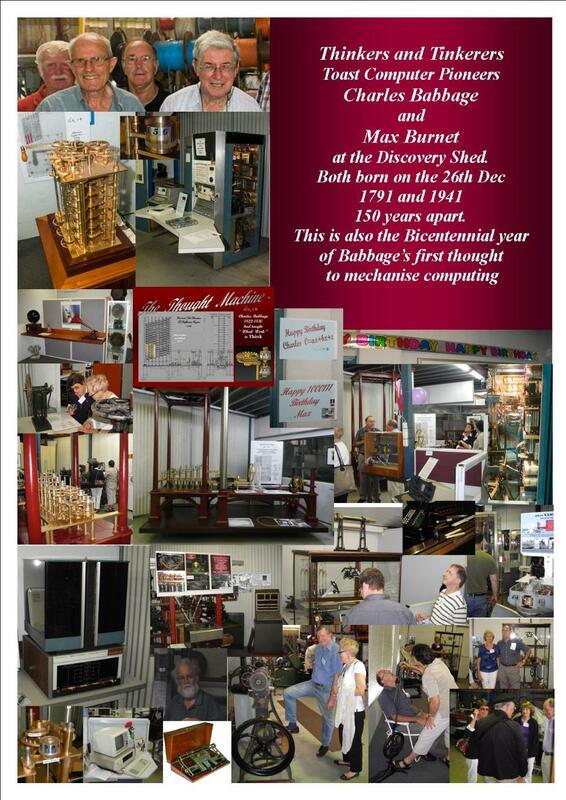 Max Burnet graduated from Melbourne University with a Bachelor of Science (Honours) in electronics in 1962. He then spent four years as a Scientific Officer at the Weapons Research Establishment in South Australia. He joined Digital Equipment Corporation Australia in 1967, and spent 31 years with them, to become the longest serving employee in Australia. He opened Digital's Melbourne office in 1967 and their Adelaide office in 1971. During the period 1975 to 1982 he was Managing Director of Digital in Australia until missing budget in the 1982 recession! In later years he managed Digital's local content project. In Aug 1990, he was the Director of the DECworld'90 event in Canberra. For twenty years he managed Digital's user society, DECUS, which had up to 5000 loyal members. In 1998 he took early retirement a few days before the Compaq takeover, not wishing to be compaqted. During his time at Digital, he collected a museum of all the early DEC computers and was known around the company as "Museum Max". In 1993 he was one of 15 pioneers featured in Computerworld Newspaper's "Pioneers of Australian Computing" booklet. He has established a company called BACK Pty Ltd, which is Burnet Antique Computer Knowhow - and plans to use his museum collection to provide for porting of old media and all manner of technical, educational, historical and display activities. BACK, Burnet Antique Computer Knowhow Pty Ltd, has an extensive collection of early computers and data processing artefacts dating back to 1910. It comprises over 60 six foot cabinets. It is considered to be the best collection of Digital Equipment Corporation material in the world. There are also over 6000 items of literature, handbooks, engineering diagrams and software, all catalogued and accessible. BACK has no grand plan to have these items gathering dust in a museum, but rather to maintain and use them as working tools for a variety of projects. BACK is convinced that in 50 or 100 years, such items will be of immense value and interest. All these items are currently distributed in a number of warehouses around the Sydney area. Inspections can be arranged. Some are on display in public places such as company foyers etc. A description of the BACK collection and philosophy can be found in an article in the December 1996 issue of the Digital Technical Journal. Preserving Computing's Past: Restoration and Simulation by Maxwell M. Burnet and Robert M. Supnik. Allan Bromley (1947–2002) was an Australian historian of computing who became a world authority on many aspects of early computing and was one of the most avid collectors of mechanical calculators. His work on understanding Charles Babbage's calculating engines is Allan Bromley's greatest legacy. The October-December 2000 issue of the IEEE Annals of the History of Computingwas dedicated to him for the quality of his research on this subject. His studies of the Antikythera mechanism led to the first working model of this ancient analog computer. Allan Bromley was an associate professor at the University of Sydney. His main academic interest was the history of computers.